1 bedroom, 1 bathroom, living area, and loft with log stair case and 8’ porch. 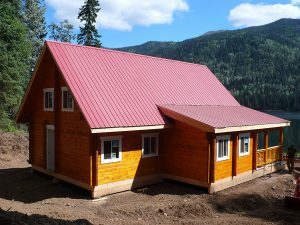 Log frame: Consisting of 3”x 6” tongue & grove logs (t&g) with saddle notch connections, ridge beam, loft joists with 2”x 6” t&g floor and log stair, timber truss with posts and jacks, inside walls in 3” x 6” logs and special log screws to secure logs. Wood floor: We can provide the plan for the wood floor incl. detailed plans for the joist layout.